Vice Governor Moritake Tomikawa (center) greeting the audience at the 110th anniversary ceremony for Okinawan immigration, taken on August 5 at the Okinawan Cultural Center in Brazil (provided by the Okinawa Tourist). 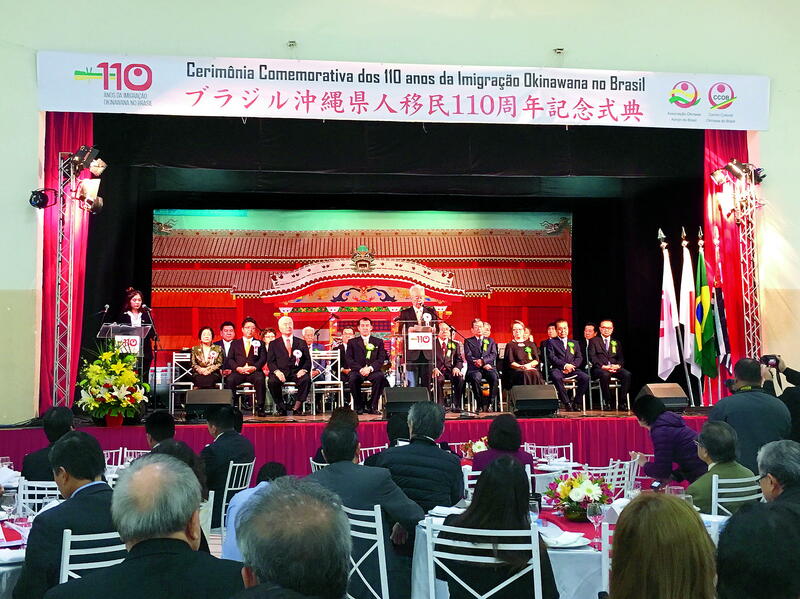 On August 5, the 110th anniversary ceremony for Okinawan immigration to Brazil was held at the Okinawa Cultural Center in Diadema, Brazil. Okinawa Vice Governor Moritake Tomikawa and others from Okinawa attended the ceremony. Participants told the history of hardship endured by the first immigrants who traveled to Brazil via the Kasato Maru in 1908. Participants also reaffirmed their desire to deepen the ties among Uchinanchu. There was a memorial service and a celebratory parade to reminisce the achievements of the Okinawan predecessors. In addition, there was a ceremony where letters of appreciation were presented to the elders of Okinawan descent. The 110th anniversary ceremony for immigration was also held in Argentina on August 8 and in Bolivia on August 12. According to a representative of the Okinawa Prefecture, Vice Governor Tomikawa relayed a message from Governor Takeshi Onaga during the ceremony. During the awards ceremony that was held at the Legislative Assembly of Sao Paulo on August 3, letters of appreciation from Okinawa Prefecture were presented to peoples of merit who strove to develop a society for Okinawan descendants and cultural exchange between Okinawa and Brazil. People who are 90 years old or above were also given awards. Isao Yamashiro, who held the positions as the president of the Okinawan Association and the chairman of the Okinawan Cultural Center in succession, represented the Okinawan descendant awardees and gave a speech. On August 4, there was a pre-event parade where many people of Okinawan descent participated dressed in Ryuso (traditional Okinawan attire). The 16th Vila Carrao Okinawa Festival was also held in the Vila Carrao District of Sao Paulo. Besides people of Okinawan descent, many local people also attended. In the afternoon on August 5 (August 6 in Japan), a celebratory festival was also held.